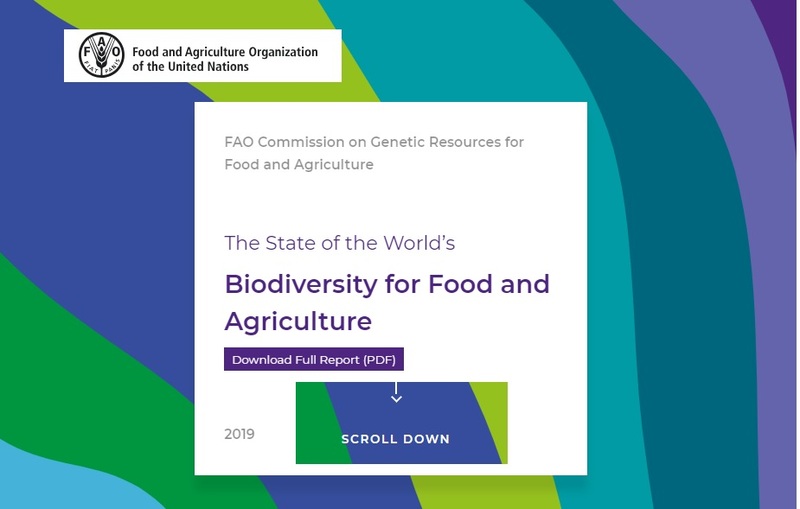 In February 2019, the Food and Agriculture Organization of the United Nations (FAO) released its new report on Biodiversity for Food and Agriculture entitled 'The State of the World’s Biodiversity for Food and Agriculture' (SoW-BFA). Based on data provided by 91 countries and 27 international organizations, analysis of global literature and datasets, and contributions from over 175 authors and reviewers, the SoW-BFA report provides an assessment of biodiversity for food and agriculture (BFA) and its management worldwide. ... "the variability among living organisms from all sources including, inter alia, terrestrial, marine and other aquatic ecosystems and the ecological complexes of which they are part; this includes diversity within species, between species and of ecosystems. Diversity indices are measures of richness (the number of species in a system); and to some extent, evenness (variances of species’ local abundance). They are therefore indifferent to species substitutions which may, however, reflect ecosystem stresses (such as those due to high fishing intensity)" (browse AGROVOC in SKOSMOS to see related definitions). needs and challenges in the management of BFA. Approaches to monitoring the status and trends of BFA vary across sectors and across categories of biodiversity, depending, inter alia, on what data are considered useful for management purposes, how difficult such data are to collect, and the extent to which the relevant resources and capacity are available. Risk categorization can be based on more or less complicated methods, depending on the availability of data on population sizes, structures and trends, geographical distributions, threats and other factors. If population data are available, it is also possible to calculate statistics based on the distribution of the individual organisms within a population across species (or breeds, varieties or other categories) and to monitor how these change over time. Even in developed regions, where the population trends of many species are well monitored and there are numerous ongoing research projects on the links between biodiversity and food and agriculture, available data often provide only a snapshot of the status of individual species (or groups of species) in particular production systems, habitats or geographical areas. While it is clear that many components of BFA are declining, lack of data often constrains the planning and prioritization of effective remedial measures. This means also that the broad scope and innovative perspective of the BFA assessment presents challenges in terms of data collection and analysis at all levels. highlighted that methods for recording, storing and analysing data on changes in the status of species and habitats in and around production systems, and making them accessible to those that need them should be improved. Discover VEST/AgroPortal AgriSemantics map of Data Standards, FAIRSharing, RDA IGAD ‘Landscaping the Use of Semantics to Enhance the Interoperability of Agricultural Data'… and keep coping with FAIRifying challenge! You can now get Full-Text content via Research4Life/AGORA (Access to Global Online Research in Agriculture) enhanced with new Country-Specific Search in Summon! To keep up-to-date with AIMS news, please, Sign up for AIMS news, follow @AIMS_Community on Twitter. And, thanks again for your interest!